I got the world’s best press release and I think I’ll be printing it up and tucking it into my husband’s Valentine’s Day card this year. 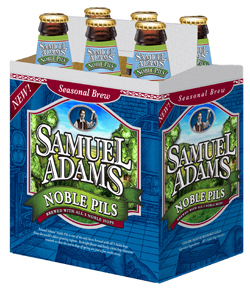 Apparently Sam Adams has new spring seasonal beer, Noble Pils. It’s made with tons of hops, and hops are flowers! So if I just pick up a twelve pack of beer it’s like a dozen roses. Only I can get it at the grocery store and my husband will actually enjoy it. I know it’s a little different, but everything about it makes me giggle, so I’m buying my husband a dozen beers for Valentines Day and pretenting it’s a bouquet. So, you’re gettin’ the ol’ man drunk for the big day? Being a bit of a beer nerd/junkie/drunk I went to the Wikipedia and read about Pils. Pils is short for pilsner which is a type of lager that has a more pronounced hop aroma and flavor than most lagers. Go ahead and google it at the wiki thingamajig. Hops might be the greatest thing to ever happen to beer, and hops is a close cousin to our friend (whispers) weed. Seriously, have you ever smelled fresh hops? It’s a flower bud just like that other thing. I live in Yakima, WA. Apparently we grow and supply 80% of the worlds hops, or some ridiculous amount. The smell on a crisp fall morning, as truck after truck passes by, loaded with those giant burlap bales, is intoxicating in itself. Makes one want to start the morning off with a nice cold one! LOL!!!! my husband bought and drank this last night. cheers! Been looking for the perfect gift. Got him the new coffee pot he wanted, and a lovely pair of lined work gloves, but this will be the thing he really loves! Hey this is a great idea! I am so doing this. Thanks! not a bad idea. my husband LOVES beer and…well, never mind. Thanks for the fabulous idea!! We have a “best gift for $5 contest” this year and I’m do going to win with this!! That is a good idea. My husband doesn’t like beer though. I ended up getting him a DVD with tons of shooting and swearing. Because nothing says I love you like a man shouting profanity while holding a rifle.